Home › Investment › Should super fund Australia’s infrastructure programs? Both of Australia‘s major political parties have had grand aspirational plans for ramping up spending on nation building infrastructure. Prior to the election, Labor re-floated the concept of a Very Fast Train link between Brisbane and Melbourne to cost $114 billion. Labor proposed a preliminary feasibility spend which might bring this visionary project into the realm of possibility. Although respected former National Party Leader and Deputy Prime Minister Tim Fisher is an enthusiastic proponent of a VFT link between the three Eastern capital cities, and the National Capital, others within the coalition have argued against it, as being quite uneconomic, at least in the foreseeable future. Australia’s limited and sparsely settled population, the vast distances involved, the high costs of land acquisition and construction, have contrasted with the greater speed, the existing infrastructure network and the present affordability of Australian domestic air transport services. The popular ABC TV program Q & A featured Bill Shorten, and left-wing member Anthony Albanese, the two candidates for an historic vote by both the parliamentary Labor membership, and a postal vote of all rank and file Labor members for the position of the party leader, and Leader of the Federal Opposition. 46-year-old Bill Shorten, the Member for the Melbourne seat of Maribyrnong since the 2007 election is said to have the support of the right-wing trade unions and is regarded as the more likely candidate to win the vote. He is well-qualified with an Arts/Law degree from Monash University, and has an MBA from Melbourne University. He has a long history of trade union involvement culminating in the position of National Secretary of the Australian Workers’ Union (AWU). 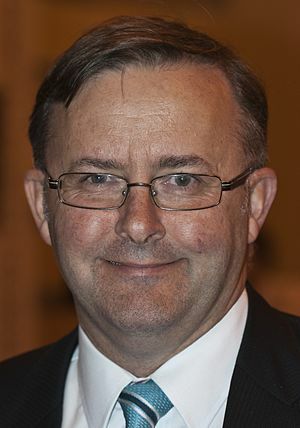 As a Parliamentary Secretary in the Rudd administration he was an ardent advocate for the National Disability Scheme, which subsequently came to fruition under Julia Gillard. As her Minister for Superannuation he was responsible for Labor’s proposed changes to superannuation, changes which muted strident criticism of Labor’s proposed tax grab on retiree income over a $100,000 threshold. Bill Shorten is seen as articulate, a moderate, compassionate on issues of disability and disadvantage and well qualified to speak on superannuation issues. As one who has read many hard-luck stories of retirees and those nearing retirement loosing their hard-earned savings in ill-conceived money-making schemes, I could not help but feel disquiet at his proposal however to tap superannuation funds for future infrastructure projects. Australia’s pool of superannuation savings is enticingly massive, being tipped to reach $3 trillion within the next decade. I fear it is seen as a pot of gold, needed only in the distant future, and a legitimate target for governments to plunder. Some infrastructure projects such as toll-roads may provide consistent cash flow and be suitable for investment by pension funds. However many other projects such as the VFT, might never produce a decent return. A guarantee by a borrowing government to reimburse funds from the loss of capital may well not be honored years later by a later administration strapped for cash when the loss becomes clear. Fortunately, many Australians believe, the Liberal-National Party won the election, and promise to be much more disciplined in their spending in comparison to the over-promising Labor party. The Superannuation representative body, “The Association of Superannuation Funds of Australia” (ASFA) today held a symposium in Wollongong devoted to this theme. “Infrastructure investment and Superannuation – the perfect match?” I look forward to reading their arguments. Somehow I think that the government will benefit much more from such arrangements than will the retirees.